Another thing is the only BJTs I can use have hFE of 194 and 250. Concerning the usual value of input resistance and output resistance of a common-emitter config, I thought its possible to realize it using only 1 BJT with common-emitter config. But it seems that whenever I successfully satisfied 2 requirements, I couldn't satisfy the third one (its like some kind of a trilemma). A very strange spec' for a CE amp! Usually you'd want the input resistance to be as high as possible so you don't lose too much signal amplitude between the source resistance and the amp input resistance. 600R is quite low. 200R is very low for a CE amp output resistance although a low output resistance is usually desirable again to avoid losing too much signal amplitude between the output of the amp and the load resistance which is often the input resistance of a following stage. You'd have to have a very low load resistance to justify having such a low amp output resistance. Such a low output resistance,R3 results in a very high collector current (23mA). Ic is usually less than 5mA in this type of design. Such a high collector current results in a very low value of re (approx. 1R). The high gain also results in a low value for R1 and the low value R1 and re together necessitate a very high value for C1 in order to pass down to 20Hz. To adjust the gain vary the value of R1. To adjust the collector DC bias point vary the value of R2 but with the resistor values shown the collector should be correctly biased to about 4.5V. Gain is independent of the transistor hFE. The bias point (Q point) and input resistance will vary to a degree with hFE. Not the answer you're looking for? Browse other questions tagged bjt resistance design common-emitter or ask your own question. How does one approach designing an amplifier using BJTs to drive an 8 ohm speaker? 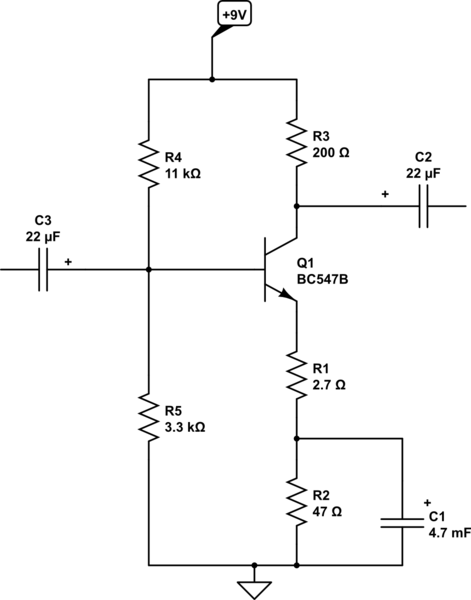 Why the input resistance of a common emitter amplifier is like this?